Malarone is one of the newest and best known treatments to prevent malaria. It is taken daily before, during and after your trip to protect against malaria when travelling to at-risk areas. 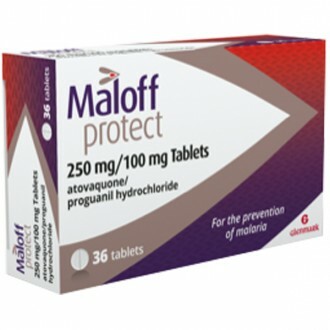 Malarone malaria prophylaxis tablets can be purchased online quickly and easily from The Independent Pharmacy Online Doctor, saving you money in the process. Don't waste time and money at expensive travel clinics, buy Malarone online today for peace of mind on your trip of a lifetime! According to the latest statistics, malaria causes over one million deaths every year. It’s important to know the facts about prevention and treatment before you travel to a high-risk part of the world. Malaria is not a virus or a bacterial infection – rather it’s a parasite that multiplies in red blood cells. Malaria symptoms occur in stages, usually 48 hour cycles. The disease can be spread by animals and humans, and is highly infectious. If a person suffering from malaria is not properly treated, they may have recurrences of the disease months later. With the right drugs, people with malaria can be cured and all the malaria parasites can be cleared. Malarone malaria tablets are available to buy from The Independent Pharmacy Online Doctor service following a free consultation, to help prevent malaria. To find out more about malaria and see all the available treatments, see our Malaria page. Malarone is a branded antimalarial medication. Malarone pills contain two active ingredients: atovaquone and proguanil. They are used to prevent malaria spread by the bite of mosquitoes encountered in tropical countries whilst travelling. Malarone tablets contain two active ingredients: proguanil hydrochloride and atovaquone. It is mainly used to prevent malaria. 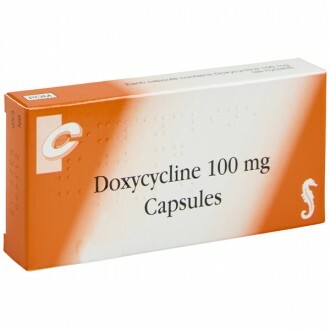 It is manufactured by GlaxoSmithKline and is classified as a prescription-only medicine (POM). Malarone is one of the newer treatments for malaria. It is taken once daily, 1-2 days before travel and continuing until 1 week after returning. Each Malarone tablet contains 100mg of proguanil hydrochloride and 250mg of atovaquone. Both of these ingredients are anti-parasitic drugs that are active against the malaria-causing plasmodium parasite. Once the plasmodium parasite enters the bloodstream, it starts to reproduce, causing malaria. Proguanil works by inhibiting the parasite’s ability to reproduce. It does this by blocking the action of an enzyme found inside the parasite. This enzyme, dihydrofolate reductase, is involved in its reproduction. By blocking dihydrofolate reductase, proguanil prevents the formation of any new genetic material forming within the parasite. This means it is unable to reproduce and multiply. Atovaquone works in a similar way to proguanil. It inhibits the production of new genetic material from inside the malaria parasite, resulting in the parasite’s inability to reproduce. Both these ingredients work effectively together in a dual attack upon the malaria-causing parasite. Malarone is highly effective against the strains of malaria caused by the plasmodium falciparum parasite. This parasite is responsible for producing the most serious form of malaria called malignant malaria. 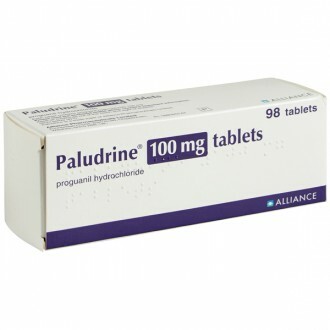 For areas where the plasmodium falciparum is prevalent, Malarone tablets will usually be the recommended choice of treatment. Malarone may also be ideal for other areas where there is a known resistance to other forms of antimalarial medicines, such as Chloroquine. Generic Malarone pills are also available in an unbranded form called Atovaquone/Proguanil. These antimalarial tablets are the same as Malarone, but are cheaper due to their unbranded nature. Pharmacist tip: Malarone should not be taken if you are pregnant or breastfeeding. It is generally very well tolerated, with only mild intestinal upsets and headaches reported. If side effects are experienced, then taking the tablets with or after a meal may help to relieve them. It’s important to note that even if you’re taking an antimalarial like Malarone or generic Malarone, it’s still important to take steps to prevent mosquito bites. The use of insect repellents, nets and sleeping in a screened room are all highly recommended. It’s also a good idea to wear light-coloured clothing that covers as much of the body as possible. Using an insecticide like a plug-in or spray is also an effective means of clearing and deterring those pesky insects. All of the above measures are particularly important after sunset. This is the time when mosquitoes are most active. As with so many things in life, prevention is better than cure. This is certainly true with regards to malaria! Using a sunscreen designed to help prevent mosquito bites. Use only recommended, evidence-based products. There is no evidence that bath oils, electronic buzzers, essential oils, garlic, homeopathic remedies, odour baited mosquito traps, tea tree oil, skin moisturisers, smoking, vitamin B tablets or yeast extract will have any effect in preventing mosquito bites. If you look at a world map, it is usually the tropical areas in which malaria originates and spreads, since the conditions provide a good breeding ground for mosquitoes. Malaria is caused by four different organisms all belonging to a family called plasmodiums. The fiercest strain is plasmodium falciparum, which can cause malignant malaria. Malarone is most effective against the falciparum strain and less effective against the others. Malarone needs to be taken 1 – 2 days before entering an area where malaria is present and continued until 7 days after leaving the malaria area. Malarone remains effective with a moderate alcohol intake. How and when do I take Malarone? Malarone is a one-a-day dose that you need to start taking 1-2 days before you travel. It is continued every day during your stay and also for an additional week after you return to a Malaria-free area. For example if you were travelling for 2 weeks you would need 23 tablets. That’s 2 (before you travel) + 14 (during your stay) + 7 (upon your return) = 23 tablets. It is advised to take Malarone with food and drink where possible. This can increase the absorption of Malarone in the body, increasing its effectiveness and possibly reducing side-effects. If you do experience side effects from Malarone they may include coughing, diarrhea, dizziness, headache, loss of appetite, mouth sores, nausea, stomach pain, vomiting, or weakness. Malarone has a small risk of nausea, vomiting, diarrhoea, and skin rash as with all medicines. Please read the Patient Information Leaflet enclosed with your medicines for a full list of side effects. Each Malarone tablet contains 100mg of Proguanil Hydrochloride and 250mg of Atovaquone as the active ingredients. Tablet core: poloxamer 188, microcrystalline cellulose, hydroxypropyl cellulose, povidone K30, sodium starch glycolate (Type A), magnesium stearate. 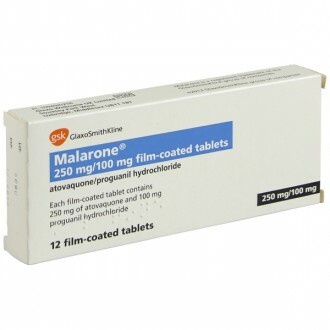 Unfortunately Malarone is not 100% effective at preventing malaria, however it is still very effective if taken properly and combined with bite avoidance methods. Things to be aware of before considering or taking Malarone. Malarone is a branded anti-malarial medication. 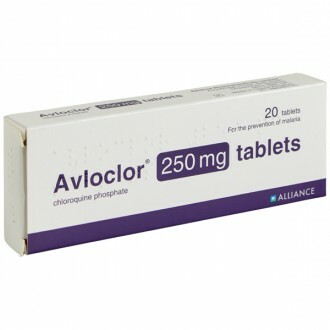 Malarone tablets contain two active ingredients, atovaquone and proguanil. They are used to prevent malaria spread by the bite of mosquitoes encountered in tropical countries whilst travelling. If you look at a world map, it is usually the tropical areas in which malaria originates and spreads, since the conditions provide a good breeding ground for mosquitos. Malaria is caused by four different organisms all belonging to the family called plasmodiums. The fiercest strain is Plasmodium falciparum which can cause malignant malaria. Malarone is most effective against the falciparum strain and less effective against the others. 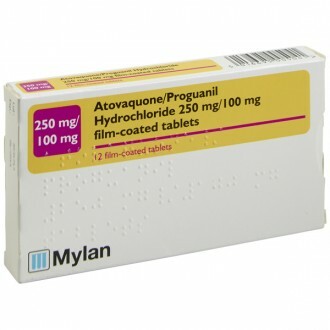 Atovaquone and proguanil both interfere with the cell replication of the malaria parasite meaning it cannot replicate in the bloodstream, therefore preventing infection. When used in combination, proguanil makes atovaquone more effective. How do I know Malarone is the right tablet for my trip? How effective is Malarone at preventing malaria? Malarone is very effective at preventing malaria. To ensure that you minimise your risk of contracting malaria as much as possible, confirm that Malarone is the correct treatment option for your destination, take your tablets regularly and always complete the full course. Is it safe to use Malarone continuously? Malarone is the newest of the anti-malarial medications that is currently available. It is normally recommended for use in trips to a malaria-risk zone for up to 28 days. There is no evidence of any adverse effects if it is used for longer. The most common side effects of Malarone include headaches, nausea, vomiting, diarrhoea and stomach/abdominal pain. These are experienced by approximately 10% of patents and most can be prevented if the tablets are taken with food or a milky drink. Who should not take Malarone? Weigh less than 40kg (a paediatric version is available for children from your doctor). Does Malarone interact other medication? Rifampicin and rifabutin (antibiotics used for the treatment of TB). Is Malarone suitable during pregnancy and breastfeeding? A study to show whether Malarone is harmful to pregnant or breastfeeding mothers has not been carried out. However, there is documented evidence to show that each of the individual active ingredients should not be administered to pregnant and breastfeeding women as they can be harmful to the child. Is it safe to buy Malarone online? Regarding online medication, it is right to be vigilant. Look out for the green cross which can be found at the bottom of any page on our website. It links through to the General Pharmaceutical Council and our registration details; they regulate pharmacy premises and pharmacists in the UK. If it doesn't have a green cross then, you cannot know that what you are buying is genuine. We are also regulated and inspected by the CQC and MHRA to ensure we provide the highest level of care and service to all of our patients. All of our credentials can be found in the footer of every page on our website. As long as you are buying Malarone from a reputable online pharmacy then you have nothing to worry about, it is no different from getting them in your local high street chemist. Never buy prescription medicines from unregulated sources, from abroad, or from websites such as Ebay. How do I buy Malarone tablets online? Ensure you have visited the government’s Fit For Travel website and have checked which anti-malarial treatment is most appropriate for you and your trip as well as any vaccines you may need for the area you will be visiting. Select the medication from the list below. Enter the amount of time you will be in the malarial zone (all our treatments are complete courses and include the tablets before and after your trip). Start the consultation and fill in the short health questionnaire. This will give the Doctor all the information they need to ensure the treatment is safe and effective for you. The Doctor reviews the notes and a prescription is produced internally for the pharmacy to dispense and dispatch. This occurs within 24 hours and the status can be followed in your account. We will contact you if the Doctor needs some more information and if they believe the requested medication is not appropriate for you, we will give you a full refund. Why is Malarone so expensive compared to other treatments? Malarone is a branded medicine and is the newest of all the anti-malarial treatments. It was originally marketed to treat malaria and its patent to prevent malaria was granted in 2001. The patent meant that only one manufacturer could produce it until 2013. This helps to recoup the initial research and development investment. When the patent on Malarone expired in 2013, other manufactures were able to produce unbranded versions and the price has dropped. The price of 1 weeks worth of Malarone is £51.90 compared to £37.50 for the unbranded or generic version. There is no difference in the active ingredients of the unbranded and branded versions. Is Malarone indicated for all travel destinations? 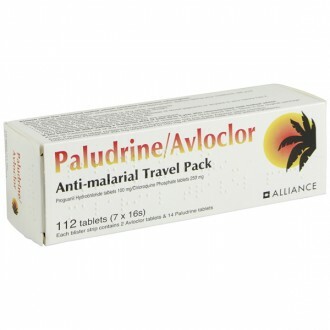 Malarone is not indicated for all travel destinations, as it is only effective against certain strains of malaria parasite that occur in specific areas in the world. Check the government Fit For Travel website for an up-to-date list of the medication and vaccines recommended for your trip. The type of drugs used to treat malaria depend on how severe the condition has become. There is also the factor of chloroquine resistance to consider, which can be a problem in certain cases. 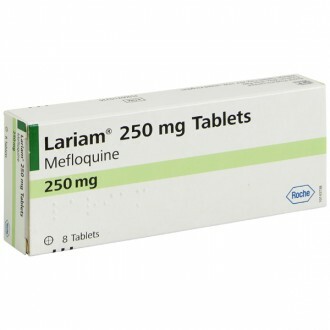 Current treatment options for malaria include chloroquine and quinine. What’s the difference between malaria and yellow fever? Yellow fever and malaria are both transmitted by mosquitoes, and share similar symptoms, such as fever, aches and nausea. However, they are not caused by the same thing. Malaria is caused by a single-celled parasite of the genus Plasmodium, while yellow fever is the result of a virus.